1 Blemished Available: $422.96 This item is available as a Blem/Refurb. These are items that cannot be sold as "New" merchandise and are limited to stock on hand. See the product details for a description of the product's condition. 1 Blemished Available: $399.46 This item is available as a Blem/Refurb. These are items that cannot be sold as "New" merchandise and are limited to stock on hand. See the product details for a description of the product's condition. Enjoying the ride is what motorcycling is all about and having a helmet that is comfortable and safe just facilitates that joy. 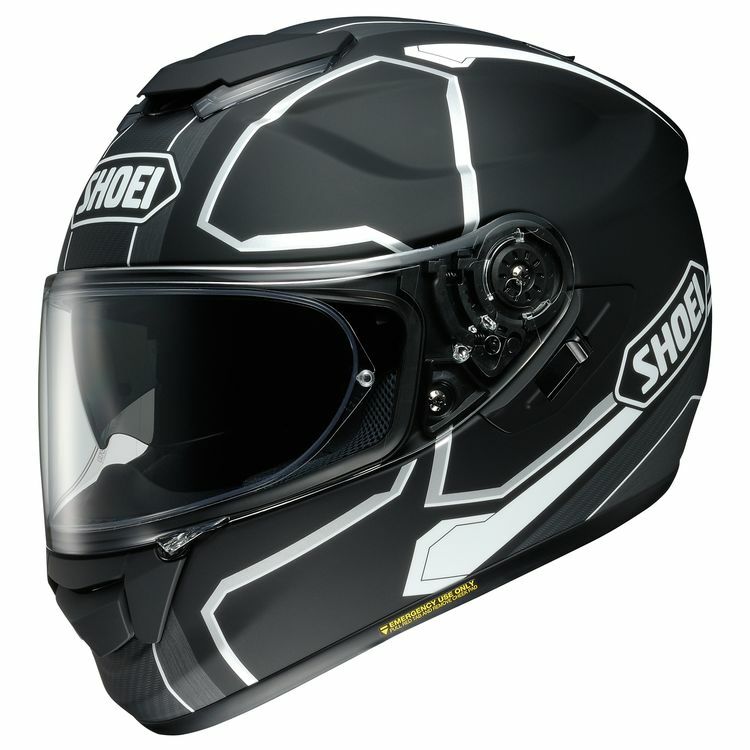 The Shoei GT-Air has been designed from the ground up to be the ultimate all-rounder. With a fully adjustable ventilation system, drop-down internal sun visor, fog-free Pinlock CNS-1 face shield and Shoei’s legendary comfort and quality, the GT-Air has all of the features you need to keep your focus on the road instead of on the discomforts a lesser helmet can cause. The GT-Air was developed using wind-tunnel testing at Shoei’s state-of-the-art facility in Japan which led to an aerodynamically-tuned tri-composite shell that mitigates buffeting, as well as wind and road noise. The plush liner is comfortable, quiet and removable when you need to wash it. Light, safe and comfortable, the Shoei GT-Air Helmet meets and exceeds the needs of contemporary riders, allowing them to enjoy what they love most: the ride. The price is good for the helmet (closeout price that is). I would not pay $671 indicated MSRP--the helmet is not worth that price! The pinlock is much appreciated and works flawlessly. I also really like the ease of the internal visor. The materials inside and out are also good quality. The only nitpick I have is that with all vents wide open, airflow is barely perceptible--ironic considering its name is "GT-Air" huh? I like the helmet overall as it is an upgrade to my old scorpion R410, but I think I'll be pulling the chin skirt out when the weather gets warmer here in Washington and pray for some additional air. Otherwise, not a helmet I would pay MSRP for by a long shot. With the upgraded materials and additional features compared to my old R410, I would say it is par for feature/price value at the closeout price, but the R410's airflow was leagues ahead of this Shoei's. I'm hoping the GT-Air2 has better airflow. Fit well and very well made. Good aerodynamics. while highway riding turning head left/right was smooth. Worth the money. I had previously always bought cheap helmets but no more. Much quieter than any lid I’ve ever owned. Only have 2 complaints. First, the drop down sun shade doesn’t come down far enough. Basically straight ahead is tinted but if you look at your gauges it’s below the shade. I’ll solve this by wearing sunglasses. I’m used to that anyway. Second, the cheek pads are tight. race fit tight. (I’ve got big hog jaws for cheeks so this is probably me and not the helmet. I’ve got the thinnest pads Shoei makes for it so I can only hope that it breaks in some. Otherwise it’s the best helmet I’ve ever owned! This is my first helmet, so no real reference point as far as noise levels, vision range, etc. Boils down to the fact that I tried it on in a brick and mortar store, liked the fit, read other reviews and bought it. All the other reviews are accurate, and I don't regret my purchase in the least. I love the flip down sun visor, and have gotten many compliments on the style so far. There's is plenty of air flow in there, it's really cool to feel like I have an air mohawk when I open the vents! Went through several helmets prior to the pendulum. Just could not find the right fit. This helmet is fit adjustable for all shapes. Accommodates glasses and includes an extra lens. Love the hi viz markings integral visor. It was very pricey but found it to be worth it . All saved up and ready to ride. 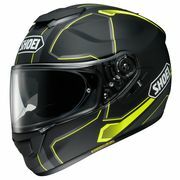 The Shoei GT-Air Pendulum is a great helmet. I have the black/Hi-Viz yellow which goes with my jacket perfect. I used the sizing chart, and when my helmet arrived, it seemed very tight. Other reviews noted this is common and said it would loosen up. Within a couple rides to work and back, the helmet did loosen up and has a great fit and comfort to it now. The view to the sides is not hampered at all, and I have no problem putting my glasses on once I have the helmet on. I wear Sonic Defender ear plugs under the helmet and there is no problems with that. The flip down tinted interior visor is great and comes in handy when driving into the sun. I would highly recommend this helmet to anyone looking at a good quality, and comfortable helmet. 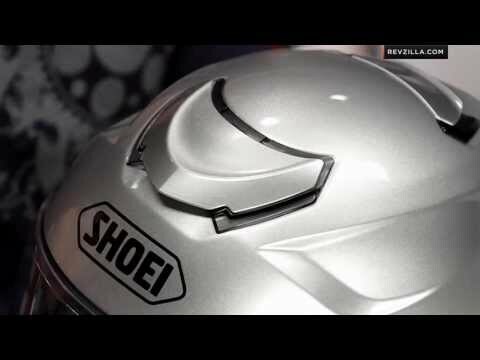 Shoei puts together a damn good package! A lil spendy but worth it for comfort and noise reduction. The airflow is amazing from all vents. Bluetooth inside the helmet is awesome and I can now feel some bass unlike my last helmet. The sunvisor is awesome adding just enough blockage. Not too dark, not too light imho. If you got the dough buy it! Okay. So this is my second helmet. First one was a hawk helmet and it was very very loud. Could not hear my self talk. Wind came over my face like there was a funnel pouring it into my face. This one. I litterally feel like a mowhawk of air is over my head. But nothing at my eyes and i love it. If it gets too warm at a stop (and it will here in cali ) its easy to pop it open partially at slow speeds or full open at stops. Winter im going to have to try the inti fog pice cause i can fog it up easily w/o it. So ill touch on that later if it lets me here. Super light compared to my last one as well. Although the cheek pad seems a lil too thick ill have to order or request the next size down for a feel on that. And ive no idea how the bluetooth intercom system sounds but i can hear my ear bud tucked behind the foam in the helm pretty good. All in all its an awesome purchase! This helmet is comfortable and quite, but that is all. It's heavy and has a narrow field of view but what is worse is that it has little to no airflow. Perfect for riding 60 degrees or below but when I took it out on an 80 degree day I nearly suffocated. It has the least air flow of any helmet I have owned and at its price point I sadly have to say that I regret my decision to purchase it. Shoei is a great brand and make very comfortable helmets but nothing is comfortable with little to no airflow unless the temps are low. I was in the market for a new helmet. My old Shoei X11 was worn out and had started to loosen up on me. When I first bought it, it was so tight I could only wear it for about 20 minutes at a time. I looked at several helmets and it came down to the RF-1200, and the GT-Air. I had RevZilla send me both and I tried them both out. The RF-1200 was a little more comfortable right out of the box. The GT-Air was more snug, but no hot-spots. This reminded me of my X11 and I figured once I broke it in that it would fit just right. Now, I’ve only got about 100 miles in on the helmet, but it’s been breaking in nicely. No hot spots and while it’s still very snug to get off and on it’s getting quite comfortable to wear for long stretches. Airflow is pretty good, but not as good as my old X11. Part of that is due to my X11 having excellent ventilation. Part of that is due to my X11 just not fitting as snug anymore. And, part of that is due to the built-in sun visor. I wear earplugs when I ride, and the noise level is acceptable. It’s quiet when you put it on, and doesn’t pick up much wind noise, but I’m not sure I’ve ever worn a helmet that wasn’t somewhat noisy, though I would say it’s quieter than my X11. I’m now thinking about getting a Sena as I can’t seem to get the helmet on/off with my current earphones (earplugs are not a problem). Over-all would recommend. Just keep in mind that the helmet is not SNELL rated so you may not be able to wear it on a track. The integral sun shield really comes in handy, and Shoei makes a quality helmet. OWNED A GT AIR PREVIOUSLY. I had the RF1100 in the past. Absolutely loved it. Went with the GT Air over the RF1200 because of the fold down tinted visor. Drop down lenses, air circulation and reliability. I like the design of this helmet and the biggest factor that led me to choose this Shoei style was the fact it had a custom Sena bluetooth for it. Wanted a good, solid helmet with a built-in visor and good airflow. 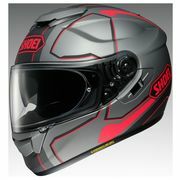 Have used Shoei's in the past and they fit me well. Great touring helmet. Fills all my needs and son wanted my other one so I needed a new one. Liked the paint on this one, and it fits. Which one has reflexters or lights on the top?? Does the GT air safety standards meet Australia standards?